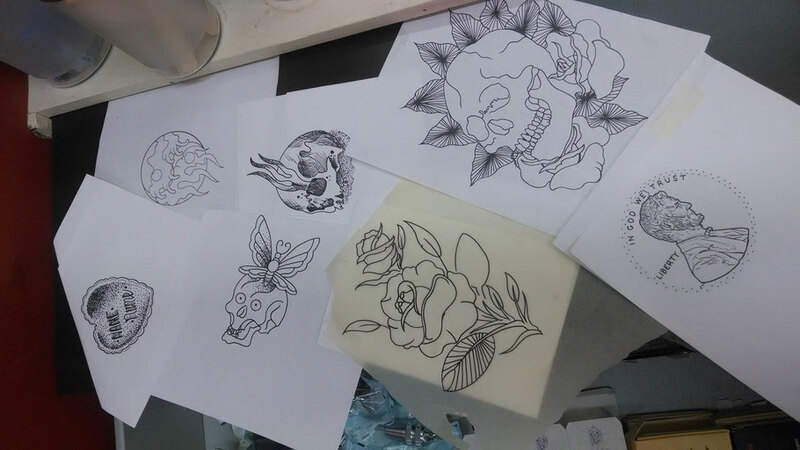 The journey to become a professional tattooer is a challenging yet rewarding endeavor. It's been nearly ten years since I realized that I wanted a body suit and over seven since I realized that wearing and receiving tattoos wouldn't scratch this itch. I didn't draw or paint or even trace well. I was, however, compelled. You see, once the understanding that you must tattoo takes hold, there is no fighting it. I prefer to make American Traditional style tattoos in only black but also enjoy colored traditional tattoos, black work, dot work, geometric tattoos, and lettering. I have been tattooing professionally since February of 2013. The road here began with an apprenticeship that began in 2010 at All or Nothing Tattoo in Smyrna, GA. I left his apprenticeship after the first year to assist Tony Mancia with opening a private studio in Atlanta. I then worked at Stowell's Hill Street Tattoo in Griffin, GA. After the closing of Stowell's place he spent time at Beyond Taboo Tattoo in Macon, GA. He came to work at Jolly Roger in December of 2016. Jolly Roger closed their doors in October of 2017. I'm now travelling full time. Thank you for taking the time to check out what I do.